Since the advent of Steampunk there has been some debate over the genre’s origins. One of the most obvious contenders is Michael Moorcock’s Oswald Bastable trilogy (The Warlord of the Air, The Land Leviathan and The Steel Tsar – all collected in this volume). Whilst it’s true that there are strong similarities – airships are ubiquitous in all three novels, along with a strong late Victorian/Edwardian sensibility – it’s clear that whilst Steampunk is, at its heart, a peculiarly rose-tinted, nostalgic retro-engineering of science fiction, the meat of The Nomad of Time is satire. Using the form of picaresque scientific romance, the novels set Bastable free as an observer in societies he can only dream of. And like Lemuel Gulliver and Wells’ Time Traveller, his unfamiliarity distances him enough to see what the natives of those societies are blind to. 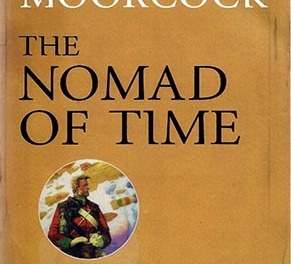 Moorcock has fun entertaining the conceits that The Warlord of the Air was dictated to his grandfather (also named Michael Moorcock) by Bastable himself; that the manuscript for The Land Leviathan was left among his grandfather’s papers – untouched – as written by Bastable; whilst The Steel Tsar was given to Moorcock junior by none other than Una Persson: a character who has graced many of his novels in one guise or another. We first encounter Bastable as a wreck of a man on Rowe Island: an opium addict, dying by degrees, and quite likely insane. Moorcock senior takes him in, feeds and clothes him, and listens without comment as the crazed Englishman narrates his fantastic story. In 1902, Captain Bastable leads a mixed force of Ghoorkas (as the deliberately old-fashioned spelling has it) and Punjabi lancers up into a mountainous state in India’s North-East. The remote country has been stoking up feeling against the British, and Bastable’s small army is dispatched as a show of force. The officers are invited to the capital to talk terms, while the rest of the troops are to await their return. Bastable and his men are drugged and although they manage to escape captivity, they become lost in a labyrinth below the Temple of the Future Buddha. Bastable eventually succumbs to the drugs, passing out. When he awakes he makes his way into the open and discovers the city is now an ancient ruin. After being rescued by a vast airship of the Royal Indian Air Service he finds he has awoken in the year 1973. Although he can never fully convince himself that he’s not still unconscious and dreaming, Bastable comes to admire the future world, where the benevolent British Empire shares the planet with the great powers of Russia, France, Italy, Germany, Japan and America. He is amazed at the progress made since his day and believes man has finally achieved a Utopia. After an enforced period of unemployment, Bastable joins the Special Air Police, trains as an airshipman and is eventually assigned to an airship under the command of the paternal Captain Quelch. However, an incident involving an objectionable American scout-pack leader leads to his expulsion from the service. Cashiered, Bastable is sought out by a Cornelius Dempsey who has some sympathy for his situation. Dempsey encourages Bastable to sign onto a tramp airship commanded by a Captain Korzeniowski. Bastable settles into the life on board, once again coming to like and admire the Polish captain. However when passengers turn out to be the notorious Count Rudolf von Bek and Mrs Una Persson – anarchists wanted throughout the civilized world – he attempts to commandeer the ship. He fails but is later released from the brig by the Chinese warlord General OT Shaw. Bastable is the only man on board still capable of flying to Shaw’s base of operations. Once more, Bastable’s fortunes are reversed. Although Shaw’s Dawn City seems to have an even greater claim to a Utopia, Bastable is instinctively suspicious. Shaw’s ambitions are familiar: the liberation of the world from oppression. With two captured airships he would make himself a warlord of the air. Inevitably an air fleet is sent against the Valley of the Morning, but the general has more than one ace left to play. The Land Leviathan begins with a short adventure of Moorcock senior’s own in 1910. Moorcock sets off for China in pursuit of the captain’s fabled valley. His journey is far from uneventful and climaxes when he is saved from a local warlord by none other than Mrs Una Persson. He joins her at her camp overnight; in the morning she, and her Mongolian warriors, are gone. With nothing else to be done, he reads the second of Bastable’s manuscripts, left behind by Mrs Persson. After leaving Rowe Island, Bastable had made his way back to North-East India. Stumbling through the tunnels below the Temple of the Future Buddha he once more passes out. Upon revival he climbs back down through the snow and is rescued by British military. It is now 1904, and again, an unrecognisable one. A world war is raging, fought by machines that had been invented in the 19th century by a South American genius by the name of Manuel O’Bean. Airships, underwater dreadnaughts, self-propelled cannon and devices known as “land ironclads”. Ignoring all warnings that Britain is lost, Bastable secures a berth on a battered steamer. The ship is sunk and Bastable is rescued by a Polish underwater man o’war commanded by Captain Korzeniowski – or rather, a Korzeniowski, for this man is a younger version of Bastable’s old skipper. Against all advice Bastable persuades the captain to drop him off on England’s south coast where he finds a country destroyed by bombardment and plague. 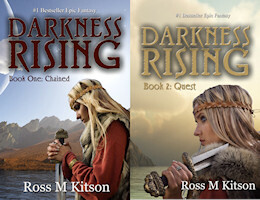 In what remains of East Grinstead he rescues Una Persson from a savage mob. She takes him as far as Lancashire in her aircar (a helicopter by any other name) from where he makes it to Skye to join Korzeniowski aboard his submarine. There is much talk of a “Black Attila”, Cicero Hood, who has united Africa, conquered the Mediterranean and has designs on Europe. When news reaches Bastable that the army has reached northern Europe he is all for a last stand against Hood in the defence of Skye. Instead Korzeniowski sails for Bantustan: a country which, under President Gandhi has remained aloof from the war and maintained an egalitarian society for its white, black and Asian population. Won over by Gandhi’s calm assurance, Bastable is horrified when he learns that Cicero Hood is to pay Bantustan a visit. The horror turns to confusion when he learns that Hood is accompanied by none other than Mrs Persson. During an official banquet, Hood and Bastable have a frank exchange of views and there is a grimly amusing moment when Hood denies that he hates white men; “…there are individuals who show all the qualities I would value in an African.” Bastable’s fate takes another twist when Gandhi attaches him to a diplomatic mission to the Ashanti Empire. From this position he is able to observe Hood’s ultimate ambition: the conquest and subjugation of America by means of the titular machine, the vast, unstoppable Land Leviathan. The opining pages of The Steel Tsar drift further into metafiction, as Moorcock junior confides that in the years since the publication of Bastable’s first adventures he has come to know Mrs Una Persson well. Their conversations have formed the basis for some of his novels. The story begins with Bastable already in an alternate 1941, fleeing the destruction of Singapore by the Third Fleet of the Imperial Japanese Aerial Navy. He is imprisoned, escapes and makes it, barely, to Rowe Island. In Olmeijer’s hotel he makes the acquaintance of another Cornelius Dempsey, although he is an older, disreputable version of the man he met in Warlord, in many ways a mirror of Bastable from the first book. Freedom is short, however, as the Japanese land on the island and arrest all Europeans. In an internment camp, Bastable gets to know the anarchist Nestor Makhno and “Peewee” Wilson: an annoying Englishman who habitually latches onto others and bores them with his half-baked political theorizing. Contriving to escape, they are rescued by a Russian fleet which had come to rescue the prisoners. His fortunes ever changing, Bastable once more finds himself on board an airship, under the command of Captain Korzeniowski. However, rather than flying against the Japanese, their ship is despatched to engage with the mysterious Steel Tsar and his Cossack army. Inevitably they are captured – by none other than Makhno – and taken to meet Djugashvili: the masked Steel Tsar himself. Peewee Wilson has allied himself with Djugashvili, obviously convincing the unstable Steel Tsar of his (almost certainly exaggerated) engineering abilities. And again, there is Mrs Una Persson. Bastable is reunited with Dempsey – who he believed dead – and meets a relative of Mrs Persson’s: Max von Bek, an albino sometimes better known as Monsieur Zenith. All three, he learns, are members of the Guild of Temporal Adventurers. Servants of the Cosmic Balance, they are attempting to influence a cyclic event which echoes across the Multiverse – but Dempsey has his own agenda. All three novels mix genuine figures (Mick Jagger, Ronald Reagan, Harold Wilson, Lenin, Gandhi, Makhno, Enoch Powell) with his own familiar cast (Mrs Persson, Captain Quelch, various Beggs and von Beks, Dr Hira, Major Nye, Dempsey, Zenith the Albino) in a glorious ride that reeks of boy’s own adventure even as they serve up serious points. Warlord is primarily about the evils of Imperialism, Leviathan is concerned with racism, whilst Tsar lays bare the delusion of political ideology (whilst containing a great deal of speculation on the nature of reality) and is the closest in tone to Moorcock’s many Eternal Champion books. Bastable is a bit of a prig, and his character changes little (as is usually the case in picaresque novels), though even he can’t remain unchanged by the trilogy’s conclusion. Artwork by the late James Cawthorn punctuates all three books and it’s a joy to see it again – though there’s not nearly enough, to my mind. John Clute and Moorcock both write Introductions which are common to all volumes in the new Michael Moorcock Collection. I’m sure completists will want to own this – there are just enough editorial changes from previous collected volumes (in order to create a “definitive” version; we’ll see) to make it worthwhile. 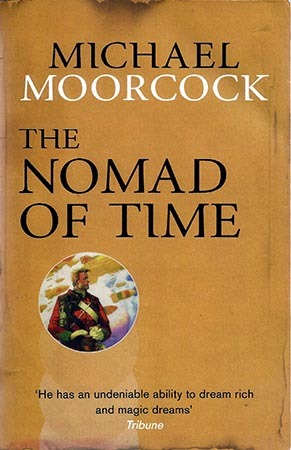 And if you’ve never read Moorcock before, this is a good a place to start as any – Steampunk or not.